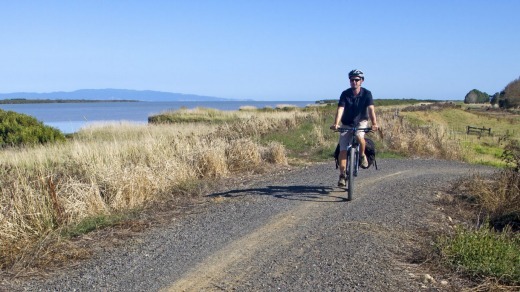 Only a year old, the Hauraki Rail Trail is already one of New Zealand's most popular cycle trails. In the New Zealand town of Thames, the main street seems to go on forever. Touted as the country's longest and straightest main street, its architecture and faded prosperity reflect literal golden days. When gold was discovered in a stream here in 1867, Thames briefly became the largest town in New Zealand. Two years ago, a new source of gold arrived in the town with the creation of the Hauraki Rail Trail. 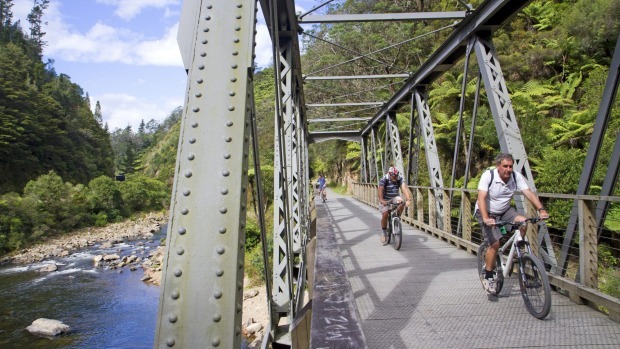 Part of a network of cycle trails carved across New Zealand, it has already become one of the country's most popular cycle trails - in its first summer alone, it was used by more than 40,000 cyclists. By New Zealand standards, the 60-kilometre-long trail is unusually flat, with distances and terrain suited to families and novice cyclists. Beginning in Thames, it heads south through the lush dairy country of the Hauraki Plain before turning east into one of New Zealand's most spectacular gorges. The tone of the Hauraki Plain is set early. The moment I leave Thames, there are cows grazing beside the path. They will be my companions, along with an occasional other cyclist, most of the way to Paeroa, midway along the ride. Out of Thames, the unsealed trail runs straight and flat along the Hauraki Plain. The horizon is stitched with hills, but on the plain the trail bends only to get around paddocks, not land features. I enter the gorge through the country's longest cycling tunnel. Stops along the Hauraki Rail Trail are neatly spaced and after almost an hour of riding I come to the Cheese Barn at Matatoki. Suitably, bicycles hang from the walls of the wooden barn, which uses milk from its own dairy herd to produce about 12 varieties of organic cheese. 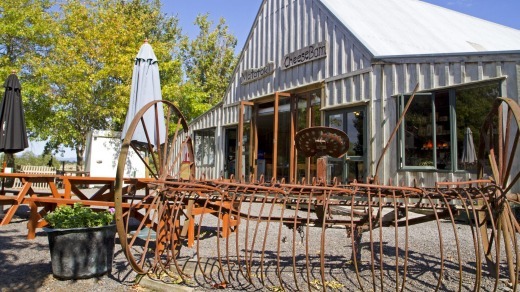 The attached cafe serves pizza, ploughman's lunches and cheese boards. 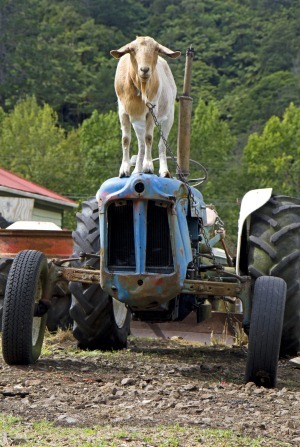 As I ride on from the Cheese Barn, farm life swirls around me. Cows gather beside the trail, hives hum with bees, and farmers slip past on quad bikes. Soon the trail turns into Hikutaia, a rural service centre that's virtually shrunk to its nucleus - a pub and a cafe. I lunch on the deck of the Convenient Cow Cafe, where cow memorabilia - painted milk jugs, teapots, even a fake cow pat on the deck - comes in herds. The dairy country continues for another 13 kilometres into Paeroa, a town less famous than the drink that's produced here. L&P - Lemon and Paeroa - is New Zealand's home-grown soft drink, made from lemon juice and water that bubbles out of a spring in Paeroa. Like so many natural springs, there are curative claims for the water - before it was turned into a soft drink in 1910, local gold miners regarded it as a treatment for hangovers and constipation. Paeroa also bills itself as the Antiques Capital of New Zealand, but it's the drink that nourishes the town. I pedal into Paeroa past the Big L&P Bottle - the Kiwi equivalent of the Big Banana or Big Pineapple - and stop for an L&P ice cream. I don't linger though, because the gorge that defines the Hauraki Rail Trail is now just ahead. The trail forks just outside of Paeroa. One path continues south along the Hauraki Plain into Te Aroha, but the more spectacular route swings east into the Karangahake Gorge, beginning a section of cycling as beautiful as any in New Zealand. The ride changes character almost immediately as the hills close in, almost clamping shut inside the gorge that's billed as one of New Zealand's 14 "natural wonders". I enter the gorge through the country's longest cycling tunnel. More than one kilometre in length, the former railway tunnel is faintly lit by ceiling lights, but there are still moments when the darkness is disorienting. However, I've come warned,and ride through the tunnel with a head torch strapped to my helmet, turning the artificial night back into day. At the tunnel's end, I emerge into sunlight and natural drama. Cliffs tower above the Ohinemuri River, while suddenly the path is filled with bikes as half of Auckland, 90-minutes' drive away, seems to descend on this spectacular section of trail. The gorge is so rugged it might never have been developed were it not for a gold strike in the 1870s. What is now the tiny town of Karangahake, climbing up the slopes of the gorge, was once a settlement of 2000 people. Mining remnants - batteries, tramways, tunnels - still line the gorge, and with the rail trail's end at Waihi now just a few kilometres ahead, I spend a morning off the bike wandering the network of walking tracks. The most popular track is the Windows Walk, where the natural beauty and the audacity of the early mining are equally spectacular. The trail ascends to a tunnel - a glimpse of the 12 kilometres of tunnels that puncture these hills - cut through a wall of the gorge. Along the tunnel, miners dug holes in the cliffs through which to toss waste rock into the Waitawheta River, 35 metres below. I stop at one window and look down on the river, where the early morning light reflecting off the cliffs gives the water a suitably golden glow. Reminders of the mining days, which ended in the 1950s, continue through the gorge until it opens out again at the Victoria Battery, where the concrete arches of the main ruin once held 15-metre-high tanks filled with crushed ore and potassium cyanide. The use of cyanide in gold mining was pioneered at Karangahake. Just beyond Victoria Battery is the Waikino train station. 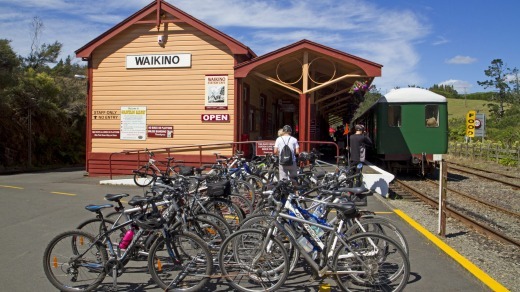 Until September last year, cyclists needed to put their bikes on a steam train at Waikino for the final few kilometres into Waihi, completing the rail trail on rails. Cyclists can still use the train, which runs three times a day, but a new section of the trail now also continues to Waihi. This trail takes a meandering course from Waikino, following the bends of the ever-narrowing Ohinemuri River to the Waihi train station, where the ride ends. I cycle on, however, pedalling into town. Where the main shopping strip ends, the gold still flows, with Waihi wrapped around the largest working pit mine inside a town in the southern hemisphere. The four-kilometre Pit Rim Walkway, which circles the mine, is open to bikes and it's a suitable end to my journey. On the Hauraki Rail Trail, I've cycled from a golden history to a golden present. The writer travelled as a guest of Tourism New Zealand. Air New Zealand operates daily flights from Sydney and Melbourne to Auckland. InterCity buses operate from Auckland to Thames (1hr 30min). See intercity.co.nz. Hauraki Rail Trail in Thames offers bike hire, accommodation bookings and a shuttle and pack-carrying service along the trail. See haurakirailtrail.co.nz. In Thames, Grafton Cottage and Chalets has great cottages with views over the Hauraki Plains and the Firth of Thames. See graftoncottage.co.nz. Grahamstown Bar And Diner, inside Thames' gold-rush-era Junction Hotel has a wide-ranging menu, from tapas and pizza to lamb shanks, roast pork belly and vegetarian risotto. In Karangahake, it's a stiff final climb to Gold 'n Views B&B, but it's worth it. Removed and remote, the self-contained cottage has a view across the hills that run south from the gorge. Owners Nigel and Pamela are happy to drive guests to nearby restaurants, including the excellent Falls Retreat. See goldnviewsbnb.co.nz.